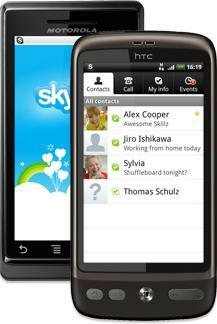 After what seems like an eternity, an official Skype application has been released for Android handsets. Before you get to excited, if you live in the United States that is, there are some limitations. While there have been unofficial ways to interact with Skype on Android phones for some time now, people have been longing for an official application like those on the iPhone have been enjoying. Well, Skype wasn't ignoring this growing segment of the market, they were just taking their sweet time getting it done. And, as was announced today, it's finally here. In the US, Skype for Android works over WiFi only. Skype for Android is not available in China and Japan at this moment. Operator charges may apply when consumers use data or roam over 3G, EDGE, GPRS. As for a reason for this, none has been given as of yet. One can assume the carriers are behind it, but that still doesn't answer the "why" of it being only in the States we are seeing this restriction. Carriers in other countries just don't care, or is that our carriers are just that stingy? I downloaded the app (available in the Marketplace or at skype.com/m) to my HTC Hero to give it a test run over Wi-Fi, and I have to say I was less than impressed. Sitting just a few feet away from my Wi-Fi router, I found the call quality crackly, and the playback from trying the Skype Test Call account even skipped a word in my test message. I'll give it another go later, but my first impression was less than enthusiastic. It is always possible that this "no 3G support" ruling could be reversed, but we're not exactly holding our breath for that possibility. What say you? Disappointed by the lack of 3G support? What did you think of the call quality?